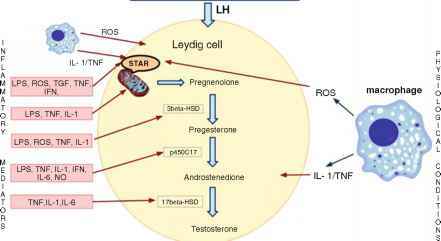 In tissues other than the testis, it has been postulated that oxidative stress can cause changes in DNA methylation. Oxidative DNA damage (e.g., 8-oxodG) may inhibit methylation at adjacent residues, thereby causing a decrease in methylation  . Age-dependent modifications of the germ cell epigenome remain relatively unin-vestigated at present; however, many of these modifications may influence gene expression during embryogenesis and thus explain some of the paternal age effects that have been demonstrated previously. It has been shown that the pattern of gene-specific DNA methylation is altered in the aged somatic tissues of many mammalian species, including humans . It is evident that with increasing age there is an increase in methylation in a number of systems, including the testis, lung, liver, blood, and stem cells [131-134] . If there is hypermethylation occurring in aged SSCs, it is understandable that aging is accompanied by a loss of developmental capacity, i.e., reduced numbers of maturing germ cells. This has recently been demonstrated in mice where hematopoietic stem cells (HSCs) from older animals display increased stem cell self-renewal, but decreased efficiency to differentiate . In contrast, it has been shown in the Drosophila testis that there are increasing numbers of GSCs in aging males containing misoriented centrosomes (normal orientation of which ensures correct asymmetric division) and that these GSCs have entered cell cycle arrest which may contribute to the decline seen in spermatogenic activity . It appears that there are alterations in either the stem cells or their niche with age; however, it remains to be shown whether this is due to the increased oxidative stress seen in aged males.